VATICAN CITY (CNS) — Christmas calls believers to see God’s presence where he is often perceived as absent, especially in the “unwelcomed visitor, often unrecognizable, who walks through our cities and our neighborhoods, who travels on our buses and knocks on our doors,” Pope Francis said. “Christmas is a time for turning the power of fear into the power of charity,” the pope said Dec. 24 as he celebrated Christmas Mass. The evening silence enveloping St. Peter’s Square was broken by the pealing of church bells following the proclamation of Jesus’ birth during the Christmas Mass. Pope Francis walked toward the altar of St. Peter’s Basilica, and stood while the cantor sang the solemn “Christmas proclamation,” recounting the timing of Christ’s birth in human history. He then removed a cloth that revealed a statue of the baby Jesus and gently leaned forward, reverently kissing it. “Everything, on that night, became a source of hope,” the pope said. “We see the footsteps of entire families forced to set out in our own day. We see the footsteps of millions of people who do not choose to go away but, driven from their land, leave behind their dear ones,” he said. 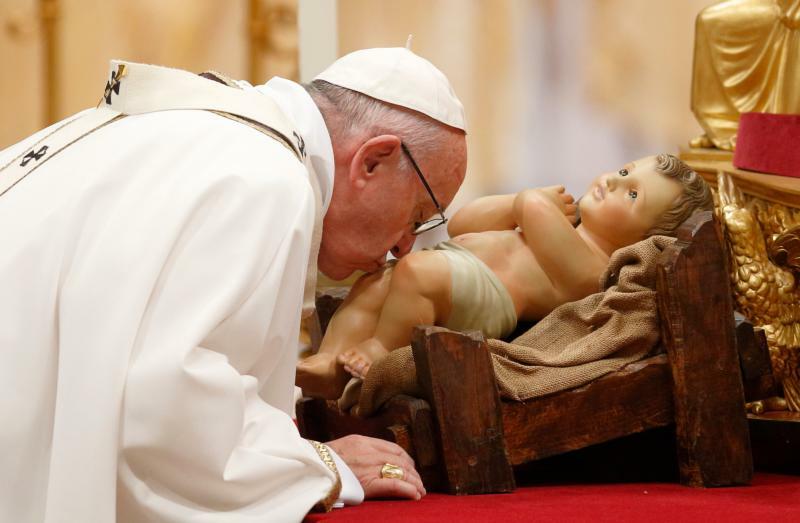 Although feared and considered “pagans among the believers, sinners among the just and foreigners among the citizens,” the pope said, it was the shepherds who were chosen to receive the good news of Christ’s birth from the angel. “This is the joy that we tonight are called to share, to celebrate and to proclaim. The joy with which God, in his infinite mercy, has embraced us pagans, sinners and foreigners, and demands that we do the same,” the pope said.